Hello, I am back and plan to stitch w/ my soldering station again. I had found the perfect MCU for a nonpareil HP-41C emulation. I had done prototyping w/ a development board which has a 6 digit 14 segment display. I need to summon an additional launchpad MSP430FR4133 so that I can have an additional 6 digits. There is no hardware keyboard yet, I am using a UART to send keys over. Here is a video for a 9, sin, cos, tan, (and reverse) forensic program, entered and executed. It will be a long way a build this into a standalone. My main task now is to try and find a 12 digit 14 segment LCD display. I am very interested in your project, please post any progress. (08-17-2015 06:35 PM)Massimo Gnerucci Wrote: I am very interested in your project, please post any progress. I'm with Massimo - very cool!! I'd like to be the 2nd customer #1. Obviously a much larger project, but also I suspect a much larger set of folks interested in buying one once available. Very interesting project, the 14-segment digits display is a key component of the HP 41, but what do you plan for the indicators (user, alpha, prgm...) ? @massimo, @rprosperi, I don't make this intending to sell them. But it's also good to know that a project is appreciated. @thomas, looks like the font table had a skip entry somewhere, will look for that in my code. This is the reason I put the video here. I can't really debug the project well as I don't have a physical unit, nor am I familiar w/ it. Still learning via a copy of the paper manual. @didier, not sure about the display yet. I was just glad to migrate Eric's code onto the platform, the LCD segment driving is a plus. There are 3 options that I thought about regarding the display. a) stock 6 digit 14 segment LED modules are available, we can have 2 of these + labelled round led for the indicators like PGM, USER, ALPHA, etc. b) graphic LCD module, characters will be 5x7 dot characters. c) custom LCD glass, modelled from the original. The MCU I am using will do well on all options. My preference is c). This is a retro toy thing project for me so it's important to have the 14 segment glass in it. Cost will be an issue though, I will be trying some custom glass providers and see if it's an affordable solution. From my research, the setup (w/ 3-5 samples) would cost $900-$1000 and unit cost is like $4 or $5 per @ 500/1000 unit batches. Now what do you think (regarding the display)? (08-18-2015 12:29 AM)Chris Chung Wrote: This is the reason I put the video here. I can't really debug the project well as I don't have a physical unit, nor am I familiar w/ it. That's taking remote debugging to the next level. Quote: Still learning via a copy of the paper manual. But you may already know that. Quote: Now what do you think (regarding the display)? A 14-segment display always reminds me of the HP-41. But using blue LED instead of LCD could look nice as well. As I wouldn't carry this around using USB for power is fine for me. Even more so if that allowed me to upload programs. (08-18-2015 12:29 AM)Chris Chung Wrote: @massimo, @rprosperi, I don't make this intending to sell them. But it's also good to know that a project is appreciated. (08-18-2015 12:29 AM)Chris Chung Wrote: Cost will be an issue though, I will be trying some custom glass providers and see if it's an affordable solution. From my research, the setup (w/ 3-5 samples) would cost $900-$1000 and unit cost is like $4 or $5 per @ 500/1000 unit batches. (08-17-2015 02:58 PM)Chris Chung Wrote: Hello, I am back and plan to stitch w/ my soldering station again. This search on alibaba has, at the first hit, a display with 14 digits of 14 segments, plus a number status annnunciators. No idea if this is actually usable for anything. (08-18-2015 10:10 AM)rwiker Wrote: This search on alibaba has, at the first hit, a display with 14 digits of 14 segments, plus a number status annnunciators. I got the manual in pdf already, thanks. For the display, I just love the 14 segments. 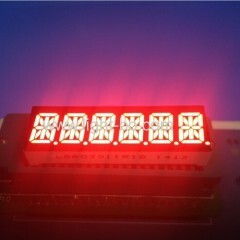 The stock LEDs that I can find is red only and the product will look like a desktop calculator due to the digit size. Graphic LCD can be an option for pocket size but it would be very true-ful to the original HP-41C. Both graphic LCD and LED will consume more power (though managable). Also the fact that this MCU is designed to drive LCD glass make it very attractive to employ this route. See? You have to set up a shop! I meant I did not create the project just to sell them. And I won't mind selling them when it's done. I would estimate I can get around 50 orders (based on NP-25 group buy), this would allow me to guesstimate whether it is feasible to get custom LCD glass. I still have not figure out the actual cost yet. (08-18-2015 12:29 AM)Chris Chung Wrote: @didier, not sure about the display yet. I was just glad to migrate Eric's code onto the platform, the LCD segment driving is a plus. I am also fond of the 14-segment display of the 41 and would love to see such a display used on a replica, so my preference goes also to option c). I was expecting a custom LCD glass to cost much more than your initial quote, so it seems that if you can get 50 people interested by the NP-41 project the NRE of a custom LCD would be around $20 which is something I would gladly pay to avoid a standard dot-matrix LCD. I would prefer to have a custom glass display with the correct annunciators as well. If 100 members buy it, then the 1000USD cost for the custom glass display development would be about 10USD + unit cost per unit. Why not start a pre-register here to find out how many potential buyers are whiling to have one of these machines? USB connection as specified by Thomas would be a huge nice feature to have! Ops! Didier beat me on this one. Sorry. (08-18-2015 03:09 PM)jebem Wrote: Why not start a pre-register here to find out how many potential buyers are whiling to have one of these machines? Bob and I already did! P.S. Replica display for me too. Maybe we could think about some annunciators more? (08-18-2015 02:11 PM)Chris Chung Wrote: For the display, I just love the 14 segments. (08-18-2015 03:08 PM)Didier Lachieze Wrote: I am also fond of the 14-segment display of the 41 and would love to see such a display used on a replica, so my preference goes also to option c). The $1K machining cost reference is what I got from some web-site. Again depend on the complexity. It may cost more as this will be a larger (relative to a watch?) glass. I cannot yet get an accurate quote yet as I need to work out the parameters. I think it will be TN as it's cheaper. I am in the process of pairing the parameter w/ the MCU capability. The FR6989 can drive up to 320 segments. I need to decide the multiplexing (it will be a 6-Mux or a 8-Mux) and at least test it w/ less segments before committing to a $1K+ buy. So this will take some time. There is no need for a pre-order as you already shown your interest. My initial thought would be that the custom LCD is a) not popular, or b) too expensive; then I have to look for alternatives like a dot matrix LCD. Still we don't know yet about (b). USB (w/ uart) is possible as well as bluetooth uart. Will be something to consider at a later phase. Eric's code shows the 41C has a host of peripheral control (printer, magnetic card, etc) that I will explore. I may not be able to give you many exciting updates on this project too often as it is still in its infancy, but your inputs are always welcome and will steer the project. So do share your thoughts. You can count on me. Thanks a lot for this project. I kind of verify that the MCU will be able to handle all the segment and can do 6-MUX (or 8-MUX). Now I am working on the physicals for the custom glass so that I can send information and ask for an actual quote. I need to ask the community for help. 1. locate a photo / drawing of the display w/ all the segments on, especially all the icons (PGM, USER, ALPHA, etc), I found one drawing on the digits and I noticed the very specific (non-coherent) segments. 2. exact dimension of an actual display, including thickness. * not sure how it will impact cost, I would think not a lot. This is Jürgen's Display Test output.